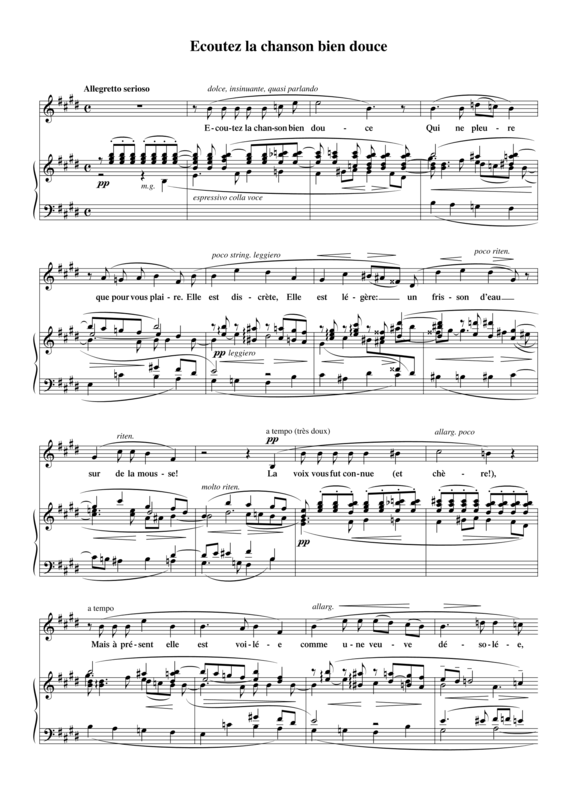 Diepenbrock’s Écoutez la chanson bien douce (Hear the Sweetest Song, RC 40) for voice and piano dates from January 1898. He initially wrote the song for mezzo-soprano in D major, but that same month he also made a version for soprano in E major. On 30 April the work was premiered in the latter version by Aaltje Noordewier-Reddingius and Anton Tierie (1870-1938). Diepenbrock made an orchestration of the song in E major in October 1907, most likely immediately after completing the instrumentation of Les chats (RC 68/81) on 10 October. For his intimate Écoutez la chanson bien douce Diepenbrock used a small orchestra of only woodwinds, without bass clarinet and strings, without the double basses. The orchestrated version of this song was not performed during Diepenbrock’s lifetime. Is as nimble and discreet! Truth’s star, now hidden, now revealed. Past death, nothing shall remain. Peace not won by victory. Than to soothe a soul in pain. Is but in durance and in passage. Heed the wisdom of this song.